Persistence Market Research (PMR) offers a 10-year forecast of the family/indoor entertainment centers market between 2018 and 2028. In terms of value, the family/indoor entertainment centers market is expected to register a high CAGR during the forecast period. This study demonstrates the global family/indoor entertainment centers market dynamics and trends across seven regions, which include North America, Latin America, Europe, East Asia, South Asia, Oceania, and MEA, which influence the current nature and the future status of the family/indoor entertainment centers market over the forecast period. This research report provides a detailed analysis of the family/indoor entertainment centers market and offers insights on the various factors driving the popularity of family/indoor entertainment centers. The report includes an extensive analysis of the key industry drivers, challenges, market trends, and market structure. The market study provides a comprehensive assessment of the stakeholder strategies and imperatives for succeeding in the business. The report segregates the family/indoor entertainment centers market based on type, facility size, and different regions globally. The family/indoor entertainment centers market is expected to witness significant value growth during the forecast period owing the rising preference for indoor entertainment. Moreover, the availability of diversified gaming and entertainment options is driving the family/indoor entertainment centers market. The report starts with an overview of the family/indoor entertainment centers market in terms of value. In addition, this section includes an analysis of the key trends, drivers, and challenges from the economy side, which are influencing the family/indoor entertainment centers market. A detailed analysis has been provided for every segment in terms of the market size analysis of family/indoor entertainment centers across different regions. 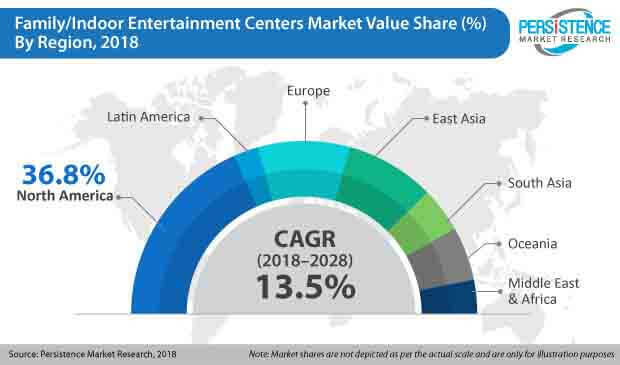 The next section of the family/indoor entertainment centers market report contains a detailed analysis of the family/indoor entertainment centers market across various countries in different regions. It provides a market outlook for 2018–2028, and sets the forecast within the context of the family/indoor entertainment centers market, which includes the latest technological developments as well as offerings in the family/indoor entertainment centers market. This study discusses the key trends within countries contributing to growth of the market, as well as analyses the degrees at which the drivers are influencing the family/indoor entertainment centers market in each region. The key regions and countries assessed in this report include North America (U.S. & Canada), Latin America (Brazil, Mexico, & the rest of Latin America), Europe (Germany, U.K., Spain, France, Italy, Russia, & the rest of Europe), East Asia (China, Japan, and South Korea), South Asia (India, Thailand, Malaysia, Indonesia, Philippines, and the Rest of South Asia), Oceania (Australia & New Zealand) and MEA (GCC Countries, Israel, South Africa, & the rest of MEA). This report evaluates the present scenario as well as the future growth prospects of the family/indoor entertainment centers market across various regions globally for the period 2018 –2028. We have considered 2018 as the base year, and provided data for the remaining 12 months. To offer an accurate forecast, we have started by sizing the current market, which forms the basis of how the family/indoor entertainment centers market will grow in the future. Given the characteristics of the family/indoor entertainment centers market, we have triangulated the outcome of different types of analysis based on the technology trends. As previously highlighted, the global family/indoor entertainment centers market is split into a number of segments. All the segments in terms of type, facility size and different regions are analyzed in terms of basis points to understand the relative contributions of individual segments to the growth of the family/indoor entertainment centers market. This detailed information is important for the identification of the various key trends in the global family/indoor entertainment centers market. In addition, another key feature of this report is the analysis of all the key segments in terms of absolute dollar opportunity. This is traditionally overlooked while forecasting the family/indoor entertainment centers market. However, the absolute dollar opportunity is critical in assessing the level of opportunity that a provider can look to achieve, as well as to identify the potential resources from a sales and delivery perspective in the global family/indoor entertainment centers market. In the final section of the report, we have included a competitive landscape to provide clients a dashboard view based on the categories of providers in the value chain, their presence in the family/indoor entertainment centers market, and key differentiators. This section is primarily designed to provide clients an objective and detailed comparative assessment of the key providers specific to a market segment in the family/indoor entertainment centers supply chain and the potential players for the same. Report audiences can gain segment-specific vendor insights to identify and evaluate the key competitors based on an in-depth assessment of their capabilities and success in the marketplace. The detailed profiles of providers are also included in the scope of the report to evaluate their long-term and short-term strategies, key offerings, and recent developments in the family/indoor entertainment centers market. Some of the key competitors in the family/indoor entertainment centers market are Dave & Buster's, Smaash Entertainment, Time Zone Entertainment, CEC Entertainment, Scene 75 Entertainment Centers, Bowlmor AMF, Main Event Entertainment, Legoland Discovery Center, Lucky Strike, Amoeba Services, Kidzania, Funcity, Nickelodeon Universe, Bandai Namco Entertainment, Tenpin, Toy Town, and Walt Disney. Family/indoor entertainment centers are indoor entertainment centers that provide a variety of entertainment to individuals of all ages. Family/indoor entertainment centers are designed to engage people of all ages at low prices. These family/indoor entertainment centers offer a variety of games, arcade games, video games, gaming consoles, machine-based games, indoor sports, and VR-based games along with the hosting of private birthday parties, etc. Family/indoor entertainment centers follow strategies such as offering gift cards, incentives, and bonuses that expire a certain timeframe that is already mentioned to customers. This encourages customers to visit a specific family/indoor entertainment center. With continuous innovations in the technological aspects, family/indoor entertainment centers are offering a diversified range of gaming options for customers. New technologies, such as 3D technology, virtual reality gaming, etc., are trending and consumers are preferring modern modes of entertainment over traditional ones. Hence, the availability of a wide range of gaming options is driving the family/indoor entertainment centers market over the forecast period. However, capital expenditure for establishing new setups for entertainment is high, which is a major challenge that is hampering the growth of the family/indoor entertainment centers market. At present, Augmented Reality (AR) and Virtual Reality (VR) games are highly trending, thus, players in the family/indoor entertainment centers market have started offering these games. Moreover, some gaming manufacturers are also focusing on developing various technologies for improvising the gaming experiences in the family/indoor entertainment centers. Manufacturers are working on mixing the AR and VR technology with 3-D projection mapping and interactive digital surfaces to generate new technologically advanced games. The VR gaming zone segment is estimated to create an incremental opportunity of $ 14,569.0 Mn in the family/indoor entertainment centers market between 2018 and 2028. Various options in family/indoor entertainment centers for celebrations, such as birthday, parties, events, occasions, etc., is contributing to the growth of the family/indoor entertainment centers market. With the addition of these options, family/indoor entertainment centers are revolutionizing the manner in which social gatherings are being conducted. Moreover, family/indoor entertainment centers offer food & beverages, gaming, entertainment, etc. under one roof, that too for the entire family, which reduces the efforts of customers for arranging the same. People also select the location of the parties that they wish to host based on the size of the family/indoor entertainment centers, as a larger number of guests requires a bigger facility. Hence, the >40,000 sq. ft. segment in is projected to grow at a CAGR of 15% over the forecast period. The loyalty programs offered by family/indoor entertainment centers is a major factor driving the market. Loyalty programs are offered based on parameters such as reward points, visit points, loyalty cards, memberships, etc. Using these loyalty programs, family/indoor entertainment centers are able to retain customers as well as attract new customers with the help of advertising. With improvements in gaming technology in past four to five years, family/indoor entertainment centers have started offering gaming options for young adults, which include indoor cricket, bowling, finger coaster, football, racing, and other simulation games. This it is another factor fuelling the growth of the family/indoor entertainment centers market. The family/indoor entertainment centers market in North America is estimated to dominate the global family/indoor entertainment centers market due to the presence of a large number of players in this region. Due to a consistent increase in the middle-class population and increasing disposable income, the family/indoor entertainment centers market in East Asia is estimated to grow at a significant rate over the forecast period, as the increasing GDP of the East Asia region is responsible for the increased spending capacity of individuals in this region. Thus, the market in East Asia is expected to grow at a CAGR of 14.3% during the forecast period. Some of the key participants in the global family/indoor entertainment centers market report are CEC Entertainment, Dave & Buster's, Time Zone Entertainment, Scene 75 Entertainment Centers, Main Event Entertainment, Smaash Entertainment, Bowlmor AMF, Legoland Discovery Center, Nickelodeon Universe, Lucky Strike, Amoeba Services, Funcity, Tenpin, Bandai Namco Entertainment, Kidzania, Walt Disney and Toy Town. Among all these centers, Dave and Buster’s is one of the prominent players in the family/indoor entertainment centers market. According to PMR analysis, Main Event Entertainment is focusing on improving its market share by launching new products in the family/indoor entertainment centers market.